As a freelance engineer, Raul Alvarez spends a lot of time on the go. He says the last four or five years he has been traveling due to work and family reasons, therefore he never stays in one place long enough to set up a proper workspace. “Whenever I need to move again, I just pack whatever I can: boards, modules, components, cables, and so forth, and then I’m good to go,” he explains. 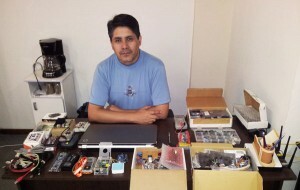 Alvarez sits at his “current” workstation. In my case, there’s not much of a workspace to show because my workspace is whichever desk I have at hand in a given location. My tools are all the tools that I can fit into my traveling backpack, along with my software tools that are installed in my laptop. Because in my personal projects I mostly work with microcontroller boards, modular components, and firmware, until now I think it didn’t bother me not having more fancy (and useful) tools such as a bench oscilloscope, a logic analyzer, or a spectrum analyzer. I just try to work with whatever I have at hand because, well, I don’t have much choice. Given my circumstances, probably the most useful tools I have for debugging embedded hardware and firmware are a good-old UART port, a multimeter, and a bunch of LEDs. For the UART interface I use a Future Technology Devices International FT232-based UART-to-USB interface board and Tera Term serial terminal software. 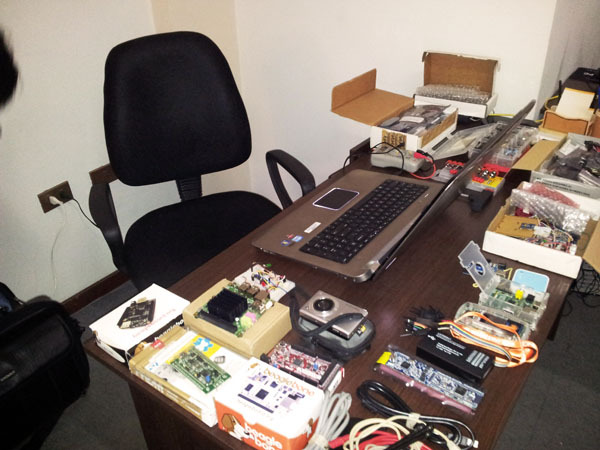 Currently, I’m working mostly with Microchip Technology PIC and ARM microcontrollers. So for my PIC projects my tiny Microchip Technology PICkit 3 Programmer/Debugger usually saves the day. Regarding ARM, I generally use some of the new low-cost ARM development boards that include programming/debugging interfaces. I carry an LPC1769 LPCXpresso board, an mbed board, three STMicroelectronics Discovery boards (Cortex-M0, Cortex-M3, and Cortex-M4), my STMicroelectronics STM32 Primer2, three Texas Instruments LaunchPads (the MSP430, the Piccolo, and the Stellaris), and the following Linux boards: two BeagleBoard.org BeagleBones (the gray one and a BeagleBone Black), a Cubieboard, an Odroid-X2, and a Raspberry Pi Model B.
Additionally, I always carry an Arduino UNO, a Digilent chipKIT Max 32 Arduino-compatible board (which I mostly use with MPLAB X IDE and “regular” C language), and a self-made Parallax Propeller microcontroller board. I also have a Wi-Fi 3G TP-LINK TL-WR703N mini router flashed with OpenWRT that enables me to experiment with Wi-Fi and Ethernet and to tinker with their embedded Linux environment. It also provides me Internet access with the use of a 3G modem. Not a bad set up for someone on the go. Alvarez’s “portable workstation” includes ICs, resistors, and capacitors, among other things. He says his most useful tools are a UART port, a multimeter, and some LEDs. In three or four small boxes I carry a lot of sensors, modules, ICs, resistors, capacitors, crystals, jumper cables, breadboard strips, and some DC-DC converter/regulator boards for supplying power to my circuits. I also carry a small video camera for shooting my video tutorials, which I publish from time to time at my website (www.raulalvarez.net). I have installed in my laptop TechSmith’s Camtasia for screen capture and Sony Vegas for editing the final video and audio. Some IDEs that I have currently installed in my laptop are: LPCXpresso, Texas Instruments’s Code Composer Studio, IAR EW for Renesas RL78 and 8051, Ride7, Keil uVision for ARM, MPLAB X, and the Arduino IDE, among others. For PC coding I have installed Eclipse, MS Visual Studio, GNAT Programming Studio (I like to tinker with Ada from time to time), QT Creator, Python IDLE, MATLAB, and Octave. For schematics and PCB design I mostly use CadSoft’s EAGLE, ExpressPCB, DesignSpark PCB, and sometimes KiCad. Traveling with my portable rig isn’t particularly pleasant for me. I always get delayed at security and customs checkpoints in airports. I get questioned a lot especially about my circuit boards and prototypes and I almost always have to buy a new set of screwdrivers after arriving at my destination. Luckily for me, my nomad lifestyle is about to come to an end soon and finally I will be able to settle down in my hometown in Cochabamba, Bolivia. The first two things I’m planning to do are to buy a really big workbench and a decent digital oscilloscope. 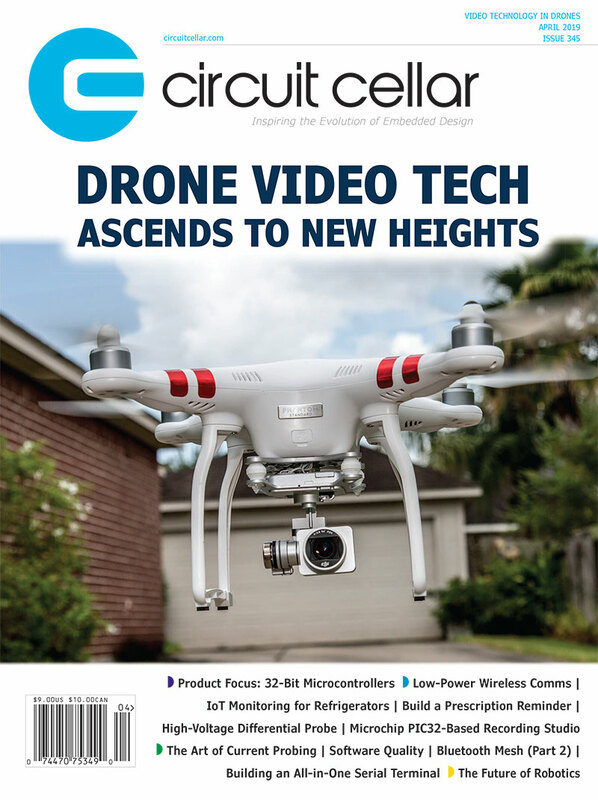 Alvarez’s article “The Home Energy Gateway: Remotely Control and Monitor Household Devices” appeared in Circuit Cellar’s February issue. For more information about Alvarez, visit his website or follow him on Twitter @RaulAlvarezT. This entry was posted in Workspaces and tagged boards, breadboard strips, cables, capacitors, circuits, components, crystals, DC-DC converter/regulator boards, development boards, firmware, ICs, jumper cables, LED, logic analyzer, Mbed, microcontroller, modular components, modules, multimeter, oscilloscope, programming/debugging interfaces, resistors, serial terminal software, software, spectrum analyzer, UART port, UART-to-USB interface board by Circuit Cellar Staff.